Why are Context Aware Systems Important now? Well, some of you may be asking that Bill et. al. have been talking about this for last 17-18 years. So, what is new? Is this just old wine packed in a new bottle? Its true that Contextual/Ubiquitous Computing has been talked about for more than a decade and a half now. But there were three key elements that have come together recently that will lead to an explosion of systems, applications and services that will make Context Aware Systems mainstream. (1) First, there are now more than a billion smartphones with inexpensive sensors embedded in it. (2) Second, these smartphones are connected 24x7 to "cloud" i.e. large banks of servers that can grow computing/storage on demand and in an elastic manner. So, all the data that the sensors are producing can be stored/crunched on phone/on cloud. (3) Lastly, we have seen Machine Learning/Data Science applied to "Big Data" and primarily driven by web in early part of last decade but now more and more mobiles/sensors and Internet of Things will drive the Big Data generation, storage and analysis. This trifecta or triple play has really caused the perfect storm. In the next post I will talk about various types of contexts and what they mean. Stay tuned! Welcome to a new blog about Context Aware Systems. We intend this to be a destination site for people to discuss and find out information about Context Aware Systems. What are Context Aware Systems? 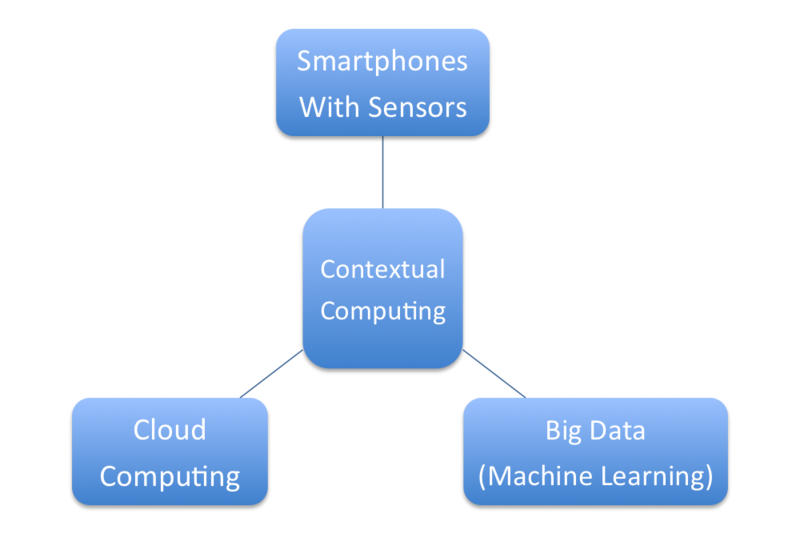 "Context-aware computing refers to a general class of mobile systems that can sense their physical environment, and adapt their behavior accordingly." A system that can "sense" what is the current context is an aware system. Most systems built till recently have been unaware of what is the context - for e.g. screensaver going on during a presentation etc. Contrast this to a smartphone today that turns off the screen as soon as you bring it close to your ear using a proximity sensor. This smartphone is "partially" aware of the context. Companies like MaxMind built GeoIP databases that mapped a user's proxy IP address to their location. So one could tell with relative certainty what was the location of a user. However, this was not absolute - try logging in from Asia via a proxy in US and most systems including Google thinks that you are "located" in US. The second and important thing that happened is that GPS (earlier a military grade technology) started appearing in commodity smartphone systems. Suddenly, one could pinpoint the location of the user to within a few feet. This really jumpstarted the Context Aware Systems and a whole host of applications under the LBS (Location Based Services) banner came into being. (3) However, the presence of sensors alone was not sufficient, sensors can generate a lot of data very quickly. How do we make sense out of so much data that is generated so quickly? Multiply that by almost 1 billion people who are carrying smartphones and you can get a sense (no pun intended) of the scale of this problem. Using commodity machines and smart machine learning/data software systems were built that could analyze massive amounts of data quickly and hence complete the last part of the puzzle, i.e. the system could "adapt" to the "context" and change their behaviour accordingly. Seminal Paper by Bill Schilit et. al.